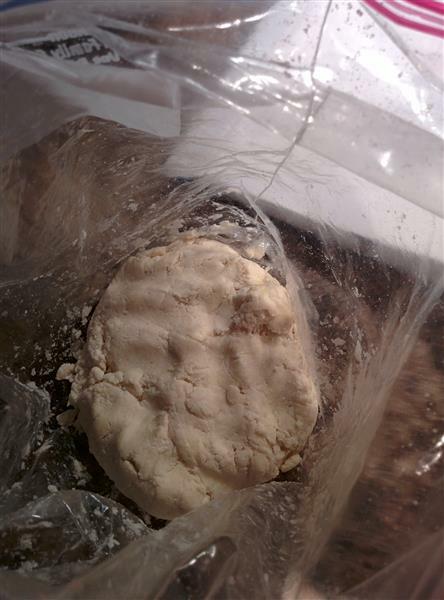 Since this is a two crust pie, you split that up into two ziploc bags, since the next step will be easier that way. What’s the next step? Kneading it! Bet you didn’t expect that, with pie dough! In this case, you basically use your knuckles, through the sides of the bags, to push & knead the crumbly mix around and get it to a pie dough consistency. It’s amazing to watch it transform from something you wouldn’t dream of attempting to roll out, into something actually resembling dough. Once it’s there, the key is letting it rest. I did this on Monday, then left it overnight in the fridge. The next night, I rolled out the base, put it in the pie plate, then stuck that in the fridge, well wrapped in plastic wrap… even though, if I remember right, the recipe said to chill it in the pie plate up to a max of 1 hour. On Wednesday it occurred to me to ask, in our Alpha Bakers Facebook group, what I should change if I’m adjusting the ratio of blackberries to blueberries. I was doing so because I couldn’t find frozen blackberries, and I wasn’t about to buy >1lb of fresh blackberries in January. Rose responded right away, saying that she was in the middle of baking, but if I had the Pie & Pastry Bible, I should check out the table of fruit, where she’s listed different types of fruit, the amount needed for a standard 9″ pie, along with amounts of sugar & cornstarch. I did so, and basically determined that the only differences between blackberries & blueberries, when it comes to pies, are: the weight that it takes to make up the right volume, and the amount of cornstarch. Blackberries need 25% more cornstarch. So, I did some math, looked at the suggested cornstarch & sugar ratios in the Pastry Bible, vs the Black & Blueberry pie recipe, figured out that the Pastry Bible was recommending far more sugar, and less cornstarch, and… ultimately, I decided not to change anything, other than to calculate the right weight of (frozen) blueberries to make up the right volume of fruit. I have a tendency to end up with slightly runny pie fillings, so I figured the slight amount “too much” of cornstarch would be fine. The filling is pretty darn easy. 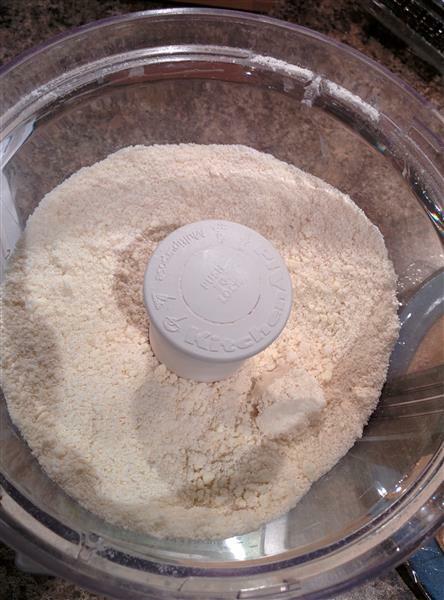 Mix cornstarch, sugar, lemon zest, lemon juice, and salt together. Roll out the top crust so that it’s ready. 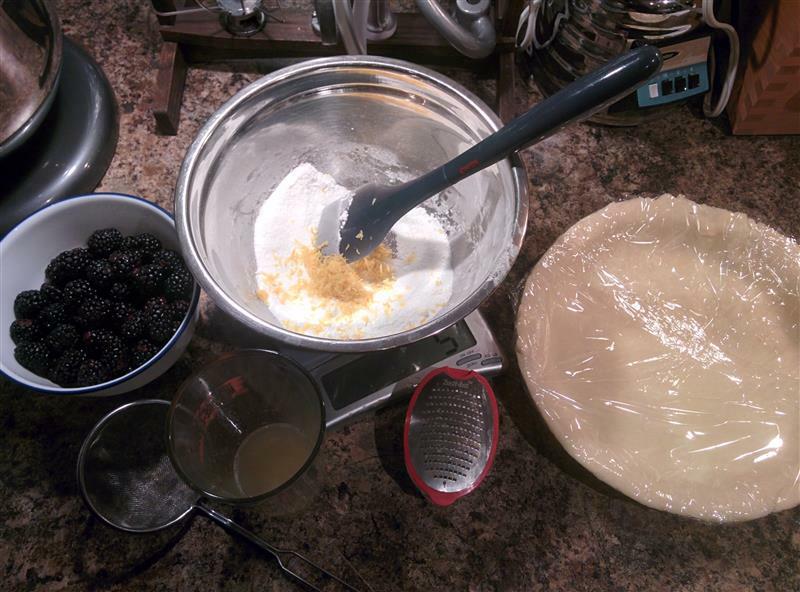 Add the blackberries and blueberries, and dump the berry mixture in the pie crust. Top the fruit mixture with the top pie crust, and tuck the top crust under the outer edge of the bottom crust, and crimp it together. Then, bake on the pre-heated baking stone in your oven. One of my baking buddies had posted early saying that her crust had collapsed under her silicone pie shield, and it hadn’t really browned properly. Rose pointed out that metal pie shields work a bit better, because they still transfer some heat, unlike silicone, so I put it in without a shield for the first 20 minutes, hoping the outer crust would set up with the crimp – which it never does, for me. After 20 minutes, I added the silicone shield. Another tip from Rose: if you don’t have a pie shield, and don’t want to futz with aluminum foil to make one, use the outer ring from a tart pan upside-down. Might try that next time. I left the pie to sit overnight before taking it to work for lunch the next day. To be honest, I expected the pie to have glued itself to the pie plate, so I was expecting a bit of a mess when I served it to my friends/colleagues. I took one of the worst knives you’ve ever seen out of the drawer at work, along with a long-forgotten pie server, and cut the pie into 5 equal-ish pieces, because we had 2 deserters and 1 person who wussed out on dessert after eating too much chili (I’m looking at you, Jason). All but one piece came out perfectly, and that last piece, I ate directly from the pie plate. 🙂 As attested to in the quote above – the filling didn’t spill out, it wasn’t runny, and it was a great consistency. I’d definitely happily make it again. Matt: What kind is it? Is it bumbleberry? Matt: So, doesn’t that make it bumbleberry? Isn’t anything that has more than one berry bumbleberry? 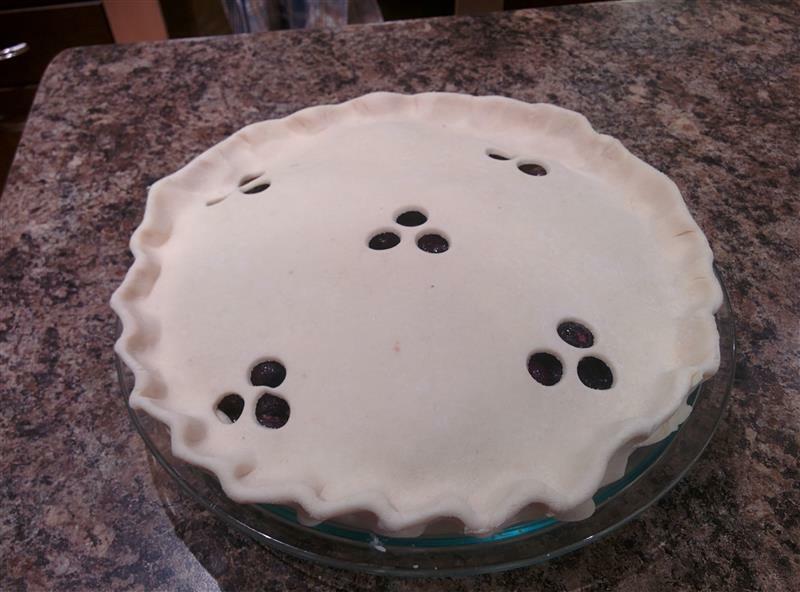 Posted on January 11, 2015 November 24, 2015 by KristinaPosted in Baking, The Baking BibleTagged blackberry, blueberry, pie, pie and pastry bible. thank you for stopping by yes I have a marble rolling pin and the handles are made out of wood your pie looks nice I love the design in a nice write up to. Great tip on using the outer ring! I had to cut aluminium foil into 2 rounds. Next time I will use your tip! I know the juices look terrible isn’t it? Esp. when it leaked from the sides..mine too! Your gingerbread house reminds me that I still have the dough in my fridge.. I have to do Valentine’s Gingerbread house now..LOL! Oh my gosh! There used to be the best pie restaurant ever called Bumbleberry Pies in my town! Just pies. Lots and lots of different pies. I don’t understand how your’s firmed up in the fridge overnight and it didn’t make any difference with mine. Such a mystery, this delicious juiciness. 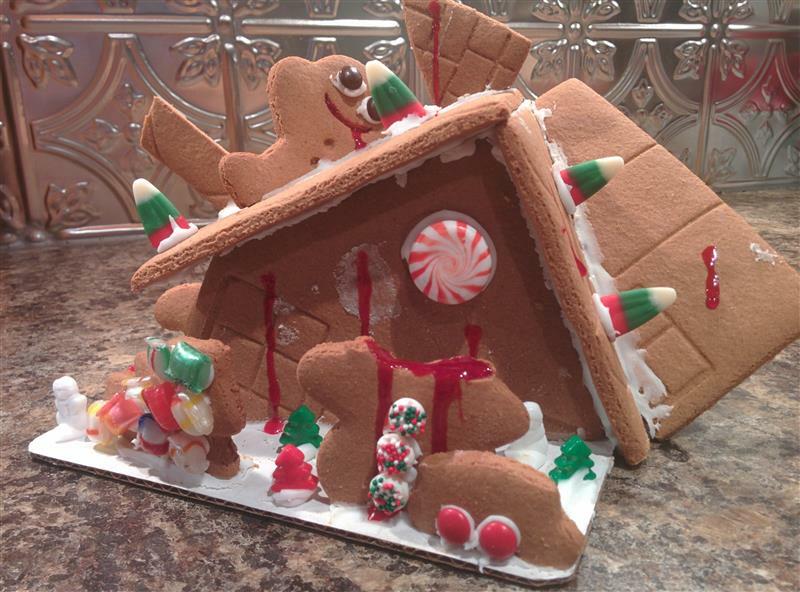 Your husband’s Gingerbread house is hysterical! So love your tin tile. I didn’t actually put mine in the fridge, I left it on the counter, since I knew the whole thing would be eaten the next day. Not sure if that made a difference, or if it was the extra long cook time? Great post. Seems like the pie was a hit too. I put mine in the fridge over night and it wan’t runny at all. you did some serious baking math! and i love how matt got super quoted! it seems as though everyone’s crust is falling down. thanks for reminding me about the upside down tart tin trick. I grew up in Indiana mennonite territory, and I never heard of bumbleberry. (Maybe I wasn’t paying attention since I thought I hated fruit pies). Your pie looked so perfect when it went into the oven. But this pie puts up a fight for those who would label it pretty. The pies do look a bit axe murderish once they’re cooked. But the colour is lovely. 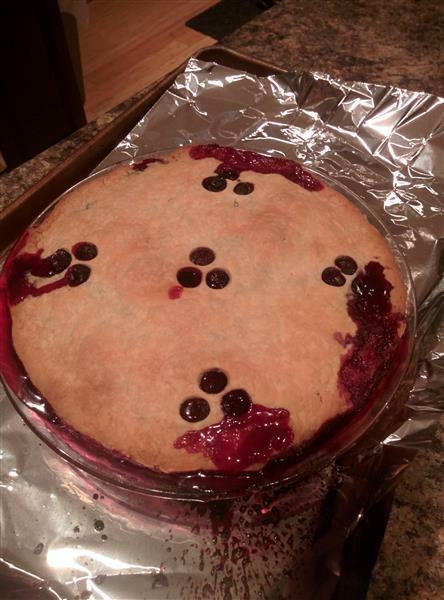 It seems I made bumbleberry pie because I had a few raspberries in there as well. Your husband’s gingerbread house is awesome. I love the decapitated gingerbread man in the front yard. Hee hee. Your pie is really lovely! And I love the story from your weekly work lunch party (great idea, BTW). Lovely. I wish I would have made a pie with more blueberries than blackberries. Oh well. Love the look of the juices overflowing – that’s the mark of a great pie in my mind! By the way, the bumbleberry pie I’m familiar with has blackberries, blueberries, and raspberries.